This is the third of a series of reviews on selected topics of electrical/electronic connector technology. You are invited to suggest a review topic of interest. In electrical delivery systems, as in every single device that uses electricity, electrical connectors are ubiquitous. The failure of a single electrical connection in a computer or automobile can mean failure of the entire working unit. In power lines, connectors play a pivotal role in the efficient transfer of electrical energy. They are used to provide electrical continuity and tapped power flow. The service performance of power connectors must satisfy the dual requirements of long service life and high cost-effectiveness in the delivery of electrical energy. Because electrical connectors can fail, they represent the weakest link in the power delivery chain. Over the past many years, increased vigilance of the health of power lines has been achieved through line surveillance techniques that rely on infrared temperature sensing. Temperature scans are done from a helicopter or truck moving parallel to a transmission or distribution line, using an infrared camera. These surveillance techniques identify "hot spots" on the lines. "Hot spots" often occur at the locations of electrical connectors and indicate failing connections. Failing connections are a harbinger of power interruptions. Electrical connections can malfunction due to a variety of physical factors that we will outline shortly. However in this author's experience, the most important factor can be traced to a common view that the use of lowest-cost connectors coupled with a line surveillance program provides "lowest-cost" service. We will make the case that the selection of a connector mostly on the basis of price, with perfunctory regard to its expected reliability in the task required of it, is a recipe for high rather than low operating cost. An analysis of cost data indicates that the acquisition cost of power connectors represents only a small part of total connector ownership cost over the expected life of the connector. Electrical connector technology involves engineering mechanics and materials science, surface physics, lubrication technology and a host of other factors that impact the reliability and cost-effectiveness of electrical connectors. For most engineers, power connectors provide a simple interface at which electrical current can flow between conductors. The story is much more complicated. The key to understanding electrical connector technology relates to the fact that all solid surfaces are rough on the microscale. This means that all solid surfaces consist of microscopic peaks and valleys. This so-called "micro-roughness" may often be felt by rubbing a finger over a surface. Surface roughness may be very small, as on a smooth shiny mirror, or very large as on a gravel road, but it is always present. For this reason, contact between two solids such as a connector and a power cable, occurs only where the micro-peaks of one surface meet the micro-peaks of the mating surface, as illustrated in Fig. 1. This true area of contact is tiny. The situation is similar to a wooden plank resting on a pebble beach. In the case of a 1-square foot wooden plank resting on pebbles, the area of true contact would be in the range of 0.01 square inch, a far cry from the nominal 1 square foot! Fig. 1. Schematic view of current flow across a rough contact interface. In most power connectors, electrical contact with power cables occurs at best over 5-10 percent of the area of nominal contact, even with a contacting load measured in tons . 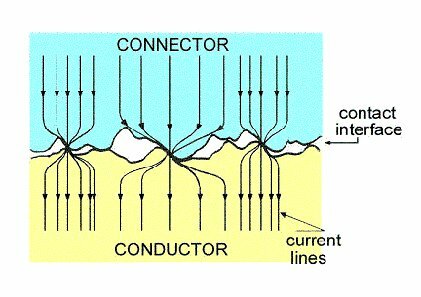 Electrical current is highly constricted at the tiny contact spots as it crosses the electrical interface, as shown schematically in Fig. 1. This constriction acts to increase resistance to electrical flow much like a constriction in a water hose opposes water flow. Increased resistance means increased power loss. Obviously, the more the number of contact spots, the smaller the power loss in the interface of the connector with the conductors. Power connectors with superior performance are designed to maximize both the number of contact spots and the life of these spots. In overhead and underground power lines, connectors are exposed to moisture, mechanical vibrations, pollutants and operational variables such as temperature excursions due to abrupt changes in operating load. If the improper connector is used or if a connector is improperly installed, these environmental and operational factors foster the breakup of contact spots and the slow ingress of electrically-insulating contaminants into the electrical interfaces. Contaminant ingress generally leads to corrosion, which also impedes current flow and increases energy loss in the electrical interfaces of the connector. Eventually, the so-called "electrical contact resistance" increases to the point where the connector temperature becomes very high, ultimately leading to catastrophic failure. Such failures cause power interruptions. There are basically three connector technologies used in the electrical power industry. These are the compression, bolted and fired-wedge technologies. Examples of these connector types are illustrated in Fig. 2. Compression connectors are attached to conductors by crimping the folding ends of the connector onto the conductors using a special tool. The installation of bolted connectors only requires a wrench. Fired-wedge connectors are installed by locking a metal wedge between the conductors using a gunpowder-activated tool . Fig. 2. 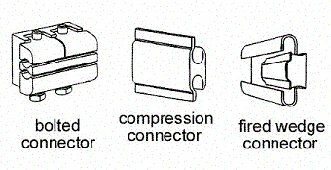 The three major types of power connectors. It is an unfortunate reality that all connectors eventually fail. Connectors that fail the least quickly provide superior service performance. Increasing concern over the impact of connector reliability on quality of power delivery has spurred a number of laboratory and field investigations of power connector performance over the past decades [3,4]. 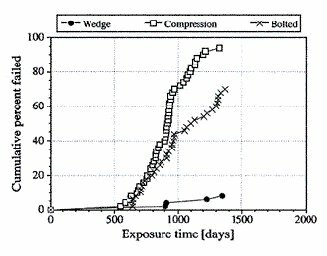 Figure 3 shows the results of a recent evaluation of the effect of exposure to a harsh seashore environment on the performance of large sample populations of compression, bolted and fired-wedge connectors . The performance parameter shown in the graph (vertical axis) is the percent of the connectors of each type that failed after exposure for a time period expressed in years (horizontal axis) to the seashore environment. Note that the compression connectors fail the most rapidly and the fired-wedge connectors survive the longest. Although all the connectors would survive longer in a less harsh environment, the data of Fig. 3 provide a rough ranking of the relative performance of each connector type in a variety of environments. Fig. 3. Failure rate of the three major connector types in a seashore environment. Despite their relatively inferior performance ranking as illustrated in Fig. 3, compression connectors remain very popular and are widely used in North America. Although there are instances where the use of these connectors is justifiable, as in a relatively dry environment, compression connectors are often used in applications where they should not. This choice is driven largely by cost. The representative price of a compression connector is about $ 0.30. In contrast, the price of a fired-wedge connector or a bolted connector of superior quality ranges from about $ 2 to $ 15. Does the widespread use of compression connectors represent the wisest option if high reliability and cost effective maintenance of transmission and distribution lines remain the long-term objective ? The true cost of unreliability in electrical connectors extends far beyond the initial price of connectors and the cost of energy loss due to connector degradation. There are additional costs due to increased monitoring and the need for preventive maintenance programs. There are also costs for repairing and replacing the connectors when they fail. Connector unreliability may also lead to civic disruptions such as interruptions in business transactions, hospital closures, unscheduled factory shutdowns etc., all of which may entail expensive litigation against utility companies. These factors affect operating cost-effectiveness. It is possible to estimate the cost of the energy lost in a connector failing in an "average" industrial environment . As the connector resistance increases over time, the power dissipation increases. Figure 4 shows the calculated cumulative cost of power lost in compression and fired-wedge connectors over a number of years, when the connectors are installed on a 200 A line, on the basis of $ 0.04 per kWH. Note that this cost easily surpasses the average purchase cost of $ 0.30 for a compression connector after only about one year on a 200 A line. The corresponding cost is very low for fired-wedge connectors. In the model presented, it is clear that the cost associated with energy waste in a distribution system carrying hundred of thousands of poorly-performing compression may quickly become significant. Fig. 4. Calculated cumulative cost of energy loss over a number of years. Perhaps more important than the cost of the energy loss in a failing connector is the effect on reliability of power delivery, and the ensuing cost of unreliability. The energy loss due to connector degradation may not be immediately apparent from a visual field inspection of distribution lines. Significant connector degradation does not necessarily cause connector discoloration or produce other unmistakable evidence of connector deterioration . Thus utility companies are hard pressed to detect worsening energy losses in connectors, even with sophisticated infrared surveillance techniques. A failing connector can quickly cause power disruption. The connector failure rate stands at about 3% in North America. 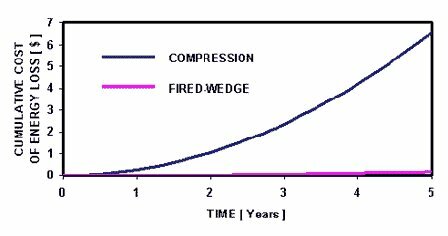 On the basis of this failure rate, recent analyses carried at our company indicate that the true cost of a compression connector used in an environment for which it is not designed actually exceeds about $ 50 after 10 years of operation. This average cost applies whether the connectors fails or not and represents about 170 times the original price of the connector. The cost covers not only energy losses but also surveillance and repair/replacement. Additional costs stemming from possible loss of business, litigation due to injuries attributed to failing connectors and decreased insurance ratings due to inferior quality, are not included. Cost issues associated with compensation for injuries sustained by line workers when installing compression connectors have recently been pointed out  and are also not included in the $ 50 figure. We estimate that all these additional costs would amount to much more than $ 50 per connector. These figures contrast strongly with the corresponding ownership cost of a reliable connector such as a fired-wedge or another connector with superior performance. In this case, the cumulative ownership cost due mostly to energy loss exceeds the original connector acquisition cost by only a few dollars after 20 years of service. With enhanced reliability, other costs stemming from repair, replacement, line surveillance, litigation etc are minimized if not eliminated altogether. R.S. Timsit, "Electrical Contact Resistance: Fundamental Principles", in Electric Contacts: Theory and Applications, Ed. P.G. Slade, Marcel Dekker, Inc., New York, 1999. J. J. Schindler, R. T. Axon and R. S. Timsit, "Mechanical and Electrical Contact Properties of Wedge-Connectors", IEEE Trans. Components, Packaging and Manufacturing Technology, Part A, CPMT-19, p. 287, 1996. D.W. Jondhal, M.L. Rockfield and G.M. Cupp, "Connector Performance on New vs. Service-Aged Conductor, Part 1", Proc. 1991 Power Eng. Soc., IEEE Trans. Dist. Conf., 91CH3070-0, pp. 857-861, 1991. J.D. Sprecher, M.L. Rockfield and T. Nothelfer, "Connector Performance on New vs. Service-Aged Conductor, Part 2", Proc. 1994 Power Eng. Soc., IEEE Trans. Dist. Conf., 94CH3426-0, Addendum, 1994. B.W. Callen, B. Johnson , P. King, W.H. Abbott and R.S. Timsit, "Environmental Degradation of Utility Power Connectors in a Harsh Environment", IEEE Trans. CPT, vol. 23, p. 261, 2000. R.S. Timsit, "Initial Evaluation of Energy Loss in Tap Connectors Used in Distribution Systems", AMP Publication 296976, 7/97, 1997. J. Snell and J.D. Renowden, "Improving Results of Thermographic Inspections of Electrical Transmission and Distribution Lines", Proc. Thermosense XXII Conf., SPIE, vol. 4020, April 2000, Orlando, FL. EPRI Ergonomics Handbook for the Power Industry: Overhead Power Line Workers Interventions, EPRI, Palo Alto, CA; 2001. 1005199. Copyright ©2005 Timron Scientific Consulting Inc.
467 Woburn Ave, Toronto, Ontario, Canada M5M 1L6. Phone : 416-787-8161, Fax : 416-787-4660.